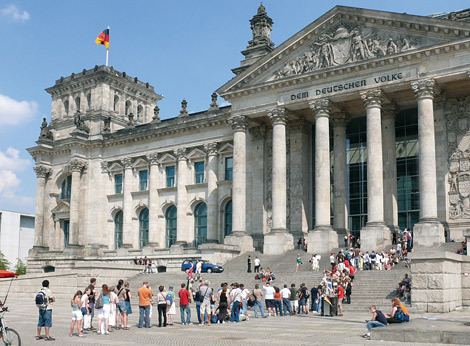 "For the first time in their history Germans are building a democratic capital city. How are Berliners themselves involved in this once-in-a-lifetime undertaking?" This was the question former Building Senator Wolfgang Nagel asked at the opening of the capital city series of events entitled "Fortress, Palace, Democratic Seat of Government" in 1992. He talked about how compatible planning for the new capital was with the existing city, the transparency of the decision-making processes, and the opportunities for citizen participation. As residents of the future capital city, the citizens of Berlin would be subject to a particular burden, as in the end they were expected to support the capital city and not merely tolerate it. Public interest was great right from the beginning. In addition to those immediately affected, citizens from all over the country got involved in the discussion about the new capital, which was initiated by architectural debates in the Reichstag building and in the Berlin Pavilion on the Straße des 17. Juni. Citizen participation played an important role right from the beginning of the development measure. Within the scope of a social survey the willingness of owners and those citizens affected by development to become involved was examined. Although social surveys are not direct components of citizen participation, they do give information about who lives within a development area and what kind of social problems there may be. They were used to help develop social guidelines and principles during the area's development and concrete strategies for dealing with problems. Social plans had to be developed in order to avoid, or at least minimise, the creation of disadvantages for people who live and work within a particular area. A focus on building housing was also declared in order to strengthen the inner-city's multifunctionality.